Facundo Castellano, FCD94, was born on July 28th, 1994. Ever since childhood his passion for cars soon became a passion for car design. Thanks to the internet, he was able to see professional designers and students upload their work and, in this way, understanding what this profession is about. Being a very expensive career and out of the country there was no other way to learn but on your own, and that’s how he did. Gaudioso Nicolas, 24, was born in Misiones Argentina on July 16th, 1993. His life story is summarized in his first word “Auto”. In each drawing of the school he had sketched a vehicle. From an early age he was influenced by creativity making his own toy cars. 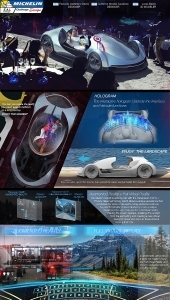 He studied Industrial Design at the School of Art and Design UNaM in Argentina, doing as a final project an electric vehicle He is interested in technology, music and science. Open to lateral thinking and generate ideas that are a favorable change for humanity. He feels he has much to contribute in this new era of paradigm shifts, where the word transport is being displaced by the word mobility, integrating more areas and providing new customs, experiences and opportunities for people. Lucas Basile, 22, is an Argentinian designer currently studying Industrial Design at the State University of La Plata. Since childhood, he had always been interested in: technology and car-design. Luckily for him both have converged in one: 3D Modeling, due to this, at a young age he started studying it by himself. One of his main motivations for entering the Michelin Challenge is to have the opportunity to show the capabilities of the designers outside the transportation design schools. 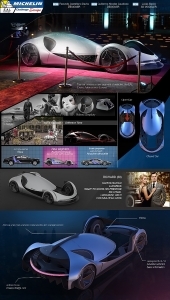 His goal is to make it into the transportation industry and one day be able to see one of his designs running on road. 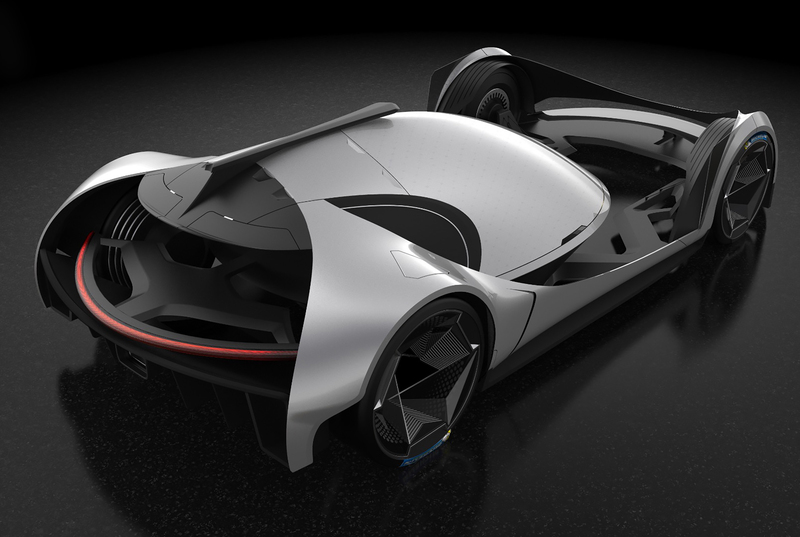 Our dream is to work in the automotive industry, so we have been doing everything possible to achieve it. We believe that Michelin Challenge Design is a great opportunity to show what we have learned, compete against designers from all over the world and learn from our mistakes. The vehicle belongs to the EAL segment (Exotic, autonomous, Luxury) which is developed on a forged carbon micro particles frame that is an evolution of contemporary technologies. The exterior of the vehicle belongs to the EAL segment (Exotic, autonomous, Luxury) which is developed on a forged carbon micro particles frame that is an evolution of contemporary technologies. The exterior is made of photovoltaic fibers that allows the absorption of sunlight helping to recharge the batteries. The vehicle has a laser lighting system covered by a glass plate that illuminates and indicates pedestrians its action. The interior is made customarily by user preferences that may give different details in metals and precious stones. 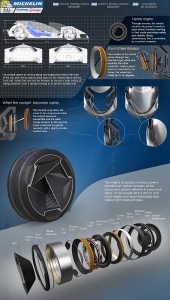 The wheels express a faceted polygonal style made of glass sheets and a titanium structure. Covered by an intelligent elastomeric component, which links driving data and surfaces, and sends the information through the vehicle’s internet system to the Michelin cloud, which has a real-time storage of Michelin’s tires performance, to be able to create better products and take advantage of the competitors. Nowadays, it’s observed that in a not too distant future, it becomes evident to break in the way of moving from a point A to a point B. The metropolises are saturated by traffic jams, there are many accidents due to human factors, the pollution intensifies and travel by any means of mobility is stressful, so you no longer enjoy driving like in the past. Also, we live in a time that is constantly in search of a sustainable replacement to the combustion cars. 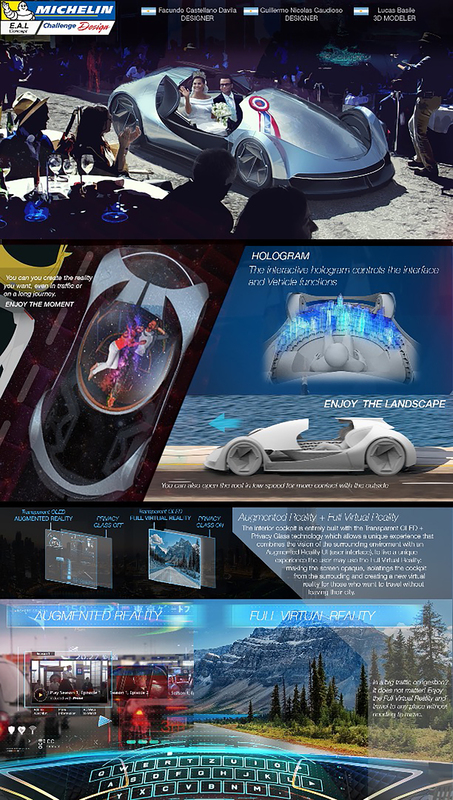 That is why this project aims at the year 2025 to change the paradigm of mobility and avoid the problems through autonomous, safe, entertaining, relaxing and unpolluted mobility. ?Autonomous mobility results in a favorable change in the comfort and experience of the users, who get rid of the task of driving and dedicate themselves to enjoy the trip. This will be the first fully autonomous car without a steering wheel, something that will mark a before and after in the history of the automobile. 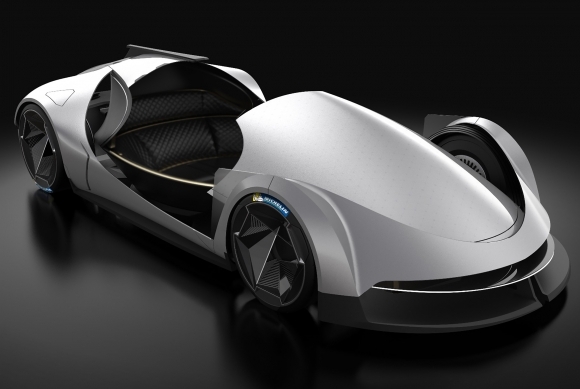 This vehicle expresses a new form of entertainment thanks to its Virtual/Augmented Reality system. Millennials have a distinctive feature when it comes to establishing a user profile, they are open to changes, the way of perceiving technology and adapting to it is totally intuitive. In this way, for these users the change of human driving to autonomous will not be a problem. The chosen user is the millennial with a high social status, a person who already has other vehicles, who is transported in a limousine and who has a lifestyle marked by luxury and fashion. It is also a young person without children, so the vehicle is designed for two passengers. The experience of using this vehicle is undoubtedly the most important advance so far, where almost all the cockpit becomes a screen and its use can be done through interactive holograms that handle it. Inside it also has several positions available to provide greater comfort and relax, allowing the user to go reclined if required. The Augmented Reality mode stands out for having a panoramic view of what happens outside the vehicle with different graphics projected on the screen, so you can make video calls, read emails, listen to music, etc. The Virtual Reality mode, where a completely different environment from the real one is projected on the whole screen, isolating completely the user from the outside, projecting different landscapes. This is done thanks to the exterior of the dome is Privacy Glass and its interior is a transparent OLED display, where due to the sensors and cameras allows Augmented Reality to work properly inside the cockpit. 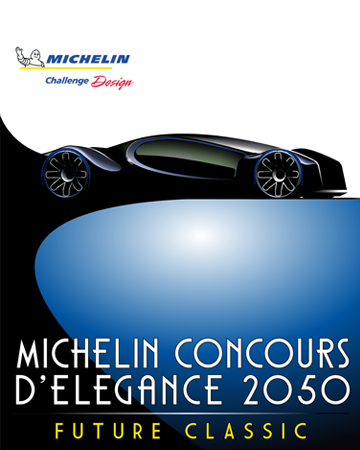 How will your 2025 vehicle become a classic and thus win Best in Show in the Michelin Concours d’Elegance 2050? 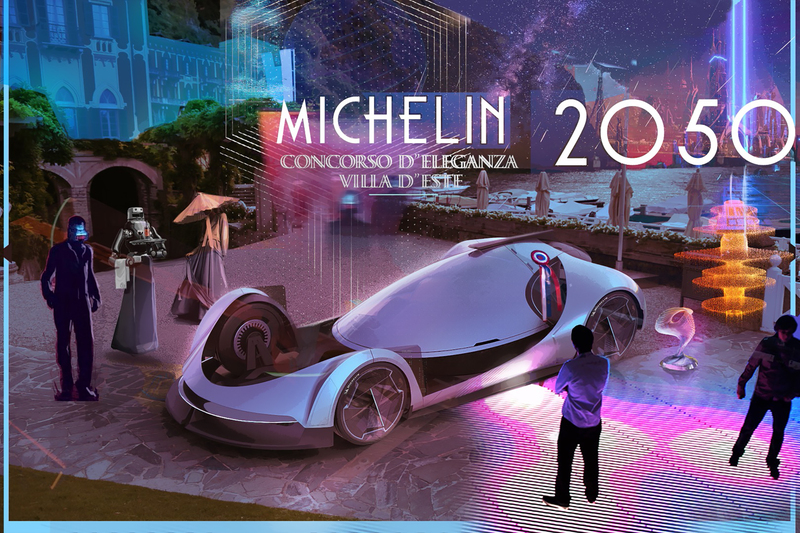 The vehicle will gain the Best in Show in the Michelin Concours d’Elegance 2050 for being the first to take the step in the change to a new generation of vehicles, creating a new segment EAL (exotic, autonomous, luxury), making other automotive brands follow in their footsteps. In conjunction with its distinctive features it becomes a vehicle to follow and imitate. Being the first production car totally autonomous and without a steering wheel will mark a before and after in the history of the automotive industry, added to its characteristics focused on user entertainment and its exotic morphology, makes it a very striking vehicle for its time, in addition to proposing a totally different concept to its predecessors, which will add a great historical value. In this way it inherently becomes a classic. What makes your vehicle distinct and collectable? A lot of people collect cars for their historical value and this vehicle surely won’t be the exception, besides that, being produced in low quantity and being made exclusively upon request will make this a very demanded car in the future, since each one is a different piece of art. Regarding the terms of the design, the vehicle still maintains a connection with the ones manufactured 140 years ago. The differential attribute is the user’s action and its interaction with the cockpit, in this way it is taken as an example to the old carriages, where the passengers enjoyed their trip without worrying about driving, in this case it takes the same property and get enhanced with a new advance in entertainment technologies. 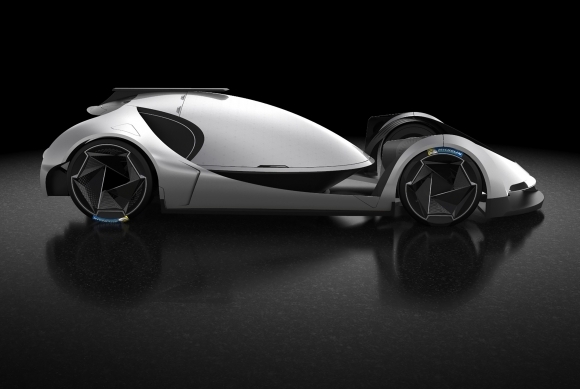 It has been decided to leave the design proposal without an apparent brand, because the rise of new technologies and the arrival of the autonomous car segment opens the door to a radical change in the industry, allowing corporations of the technology field to venture into this new market to compete directly with the brands historically rooted on it. 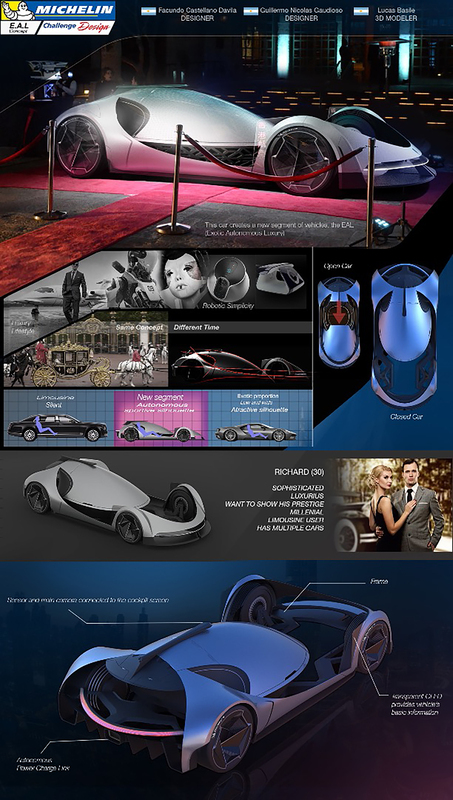 In this way, the style of the vehicle is unique and not limited to retaining the DNA of an established brand. It is the first of a new generation of vehicles where the time spent traveling is transformed into leisure. Therefore, it has the novel features mentioned above.